The Westin Beach Resort & Spa, Fort Lauderdale is a sparkling, modern Westin resort. The hotel perches directly on a coveted stretch of sand on one of Florida's cleanest beaches. The hotel was built in 1964 and reopened in 2009 following extensive renovations. The hotel was updated again in 2015. With 432 rooms, it is neither an intimate boutique hotel nor a sprawling resort complex where guests get lost. Nor their dogs; this resort observes a very pet-friendly hotel policy, welcoming canines under 40 lbs. at no additional charge. A longtime fun-in-the-sun destination, Fort Lauderdale is a relaxing South Florida Gold Coast alternative to frenetic Miami 45 minutes south. Will You Like The Westin Beach Resort & Spa, Fort Lauderdale? Who Stays at The Westin Beach Resort & Spa, Fort Lauderdale? The Westin Beach Resort & Spa, Fort Lauderdale has 432 guestrooms and suites. The hotel's high-end accommodations are its Premium Lanai rooms. 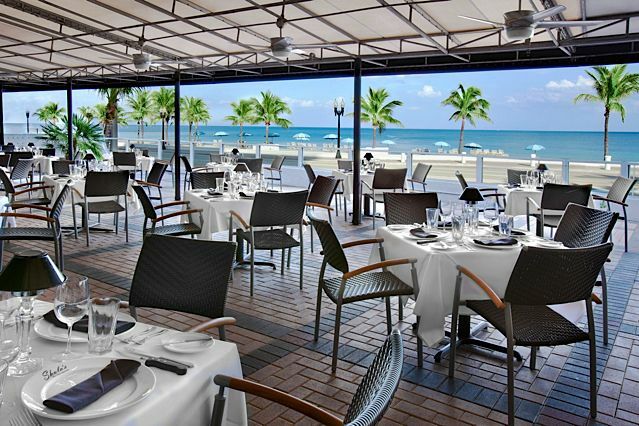 The restaurant scene at The Westin Beach Resort & Spa, Fort Lauderdale is quite sophisticated and glamorous. Guests who expect same-old resort dining will be very pleasantly surprised – and well fed. The resort's signature eatery is American Vintage Classic Bar & Grill, a casual-chic indoor-outdoor restaurant. The menu spotlights steak and seafood, handcrafted cocktails, and good wines by the glass and bottle. The hotel's round-the-clock room service is from American Vintage. Other dining venues at the hotel include Waves Pool Bar & Grill and Starbucks. The Heavenly Spa by Westin offers an array of face and body treatments for men, women, couples, and teens. Many of Fort Lauderdale's seafaring activities, like the famed Water Taxi and harbor festivals, are within a short walk of the hotel. Other attractions, like the nightlife district Las Olas, are an easy hop by land or sea. As is common in the travel industry, a Luxury Travel reporter was provided with complimentary accommodations in order to describe the hotel. For more info, see our site's Ethics Policy.